Oops - we don't appear to have a video for the fi-6770A. On top of this, the Fujitsu fi-6770A is able to scan paper that is up to 3m long, which enables it to digitize electrocardiograms, instrumental data readings and other long documents. The fi-6770A's bundled barcode and patch code reading functionality enables it to separate different jobs with its automatic job separation function. The result is improved digitizing efficiency. ScandAll PRO enables the fi-6770A to seamlessly link with Microsoft® Office SharePoint® Server for easy digitized document sharing and viewing administration. The result is even easier document management. 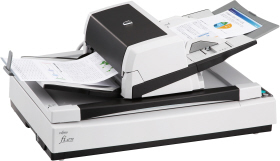 The fi-6770A itself is loaded with 2 high end "intelligent" fi-Series functions that enable it to efficiently scan mixed batch documents containing paper of different weights, quality and sizes. In addition to being loaded with a function that ensures that trapezoid-shaped documents as well as index tab and sticky note attached documents are scanned in their entirety, the fi-6770A provides a function that removes the circular and angular punch hole representations that are created from scanning loose-leaf sheets, courier service forms and other similar documents.